The region consisting of Palestine, Syria, Jordan and Lebanon forms a land bridge between the continents of Europe, Asia and Africa. Any animal, plant, or human (that cannot fly) has to pass through it to get from one of these continents to one of the others. According to the Out of Africa theory of human development, Homo sapiens developed 200,000 years ago in Africa and left via this land bridge some 60,000 years ago. Not only is it a land bridge but many of the founder crops and animals of human farming activities evolved here: wheat, barley, flax, pea, lentils, cows, sheep, pigs and goats. Probably of even greater importance, the horse evolved close by. The history of the region can be summed up, rather bluntly, as a series of conquests. Just about every local empire spent time here. They either wanted to occupy it or were passing through. The world’s history is all about peoples invading and conquering other peoples. Britain for instance has been conquered by Romans, Angles, Saxons, Jutes, Gaelic tribes from Ireland, Danes, and Normans. Spain has been invaded by Iberians, Phoenicians, Greeks, Carthaginians, Romans, Germanic tribes, and Moors. Ancient Egyptians, Canaanites, Israelites, Assyrians, Babylonians, Persians, Ancient Greeks, Romans, Byzantines, various Arab caliphates, Crusaders, Ayyubids, Mamluks, Mongols, Ottomans, British, Palestinians and Israelis have controlled the region around Palestine (including Syria, Lebanon and Jordan). This was both a highway and a desirable bit of land. Palestine lies between the Mediterranean Sea and the River Jordan within what, in 1914, James Breasted (a Chicago Professor of Archaeology) termed the “Fertile Crescent”. The modern countries that fall roughly within the Fertile Crescent are Iraq, Lebanon, Palestine, Egypt, Syria, and Jordan. It is a region of mountains in the north and desert and grassland in the south. It spreads from Egypt, up the eastern coast of the Mediterranean Sea, and across to the Persian Gulf. The history of the region is one of constant struggles between the mountain peoples and the desert nomads for possession of the fertile boundary between the two. In 1590 Edmund Spencer (an English poet) called the area the “Cradle of Civilisation” as it was then thought that farming and writing originated here. It is now thought that civilisation originated in several places independently, but the oldest site of farming is probably here in the area around the Jordan and Euphrates rivers. The Levant is a historical term describing the Syria-Palestine area. It has been used to describe an area in the eastern Mediterranean comprising Cyprus, Egypt, Iraq, Israel, Jordan, Lebanon, Palestine, Syria and Turkey. WHERE DID THE WORD “PALESTINE” ORIGINATE? The word “Palestine” has been identified from similar names found in Egyptian and Assyrian records. It is very similar to the word Philistine. The Philistines inhabited the coastal plain of Canaan in c. 1200 BCE (Before Current Era). They are mentioned in the Hebrew Bible but also in Egyptian reliefs at the Temple of Rameses 3rd as “Peleset”. The word “Peleset” is found in five inscriptions starting from c. 1150 BCE. Herodotus in 5th Century BCE Ancient Greece used the term “Palestine” to describe the entire area between Egypt and Phoenicia (roughly the coastal part of Canaan including modern Palestine). From the 9th century BCE the Kingdoms of Israel and Judah had emerged. Israel fell to the Neo-Assyrians in 722 BCE (see later). When the Babylonians invaded in 539 BCE Judah became Yehud, then fell to Alexander in 3rd century BCE, then re-emerged in 2nd century BCE following the Hasmonean revolt. Judah was defeated by the Romans in 63 BCE. During Roman times the area was at first called Syria-Palaestina then Palaestina Prima. Following the Muslim conquest in the 7th century CE (Current Era) place names were kept much the same, so we presume it was still Palaestina. From 1872 the Ottomans called the district comprising Jerusalem, Bethlehem, Hebron, Jaffa, Gaza and Beersheba the “Mutasarrifate of Jerusalem”. In the 20th century the British referred to it as Mandatory Palestine. 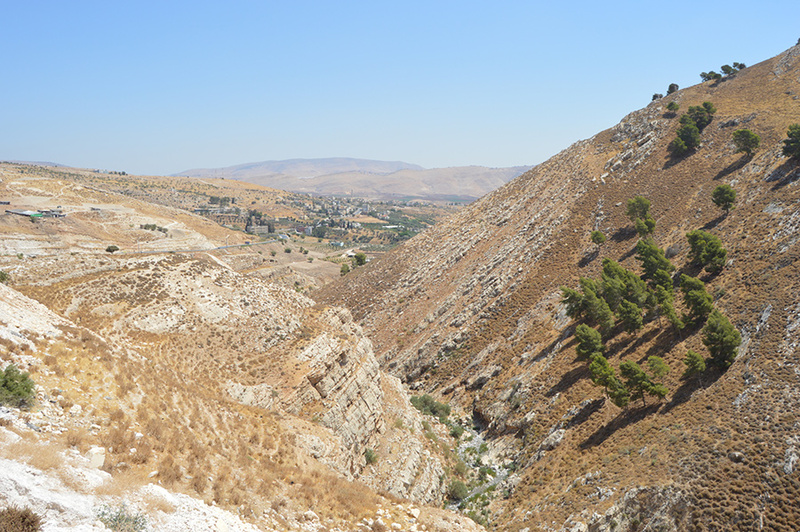 Throughout the years from 1150 BCE to the end of the British Mandate for Palestine in 1948 CE, there are numerous references to the term “Palestine” relating to the area of land between the River Jordan and the Sea. Al-Quds University (a Palestinian institution with campuses in Jerusalem, Abu Dis and al-Bireh) suggests that despite Palestine being occupied by so many empires, the population has remained constant and Palestinian. The Palestinians consider themselves to be Arabs. Pre-Islam the term “Arab” referred to Semitic peoples, mostly nomadic, inhabiting the peninsula that includes the Levant. Thus all the peoples of Palestine are of Arab origin. What divides them is religion not race. The site of the Temples in Jerusalem is said to be where Abraham attempted to sacrifice his son to demonstrate his loyalty to God. According to the Hebrew Bible, the first Temple in Jerusalem was built by Solomon in 957 BCE to replace the Tabernacle that had been constructed in the Sinai Desert. Solomon’s Temple was destroyed by the Neo-Babylonians in 586 BCE and in 516 BCE the Second Temple was built. The temple was desecrated during the Roman era by Pompey and Crassus. Herod the Great built the Western Wall in 19 BCE to encase the Temple Mount and renovated the second temple so it was renamed Herod’s Temple. The Romans destroyed Herod’s Temple in 70 CE and built a temple to Jupiter. The Western Wall is considered holy by Jews and Christians. Christians call a section of it the “Wailing Wall” because Jews are said to weep there over the destruction of the Temples. Christian pilgrimages to Jerusalem were common during the Byzantine Empire so Constantine in 335 CE built the Church of the Holy Sepulchre nearby. Following the Muslim conquest in the 7th century BCE an Islamic shrine called the Dome of the Rock was built on the site of the temple. It celebrates the ascension of Muhammad to Heaven and is the third most significant Islamic Temple. The site is of huge significance to Jews, Christians and Muslims alike. Click on any of the time periods in the Timeline below to discover information on the History of Palestine.